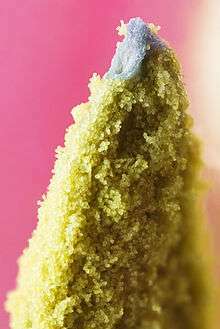 Tip of a tulip stamen covered with pollen grains. Pollination is the process by which pollen is transferred to the female reproductive organs of a plant, thereby enabling fertilization to take place. Like all living organisms, seed plants have a single major goal: to pass their genetic information on to the next generation. The reproductive unit is the seed, and pollination is an essential step in the production of seeds in all spermatophytes (seed plants). For the process of pollination to be successful, a pollen grain produced by the anther, the male part of a flower, must be transferred to a stigma, the female part of the flower, of a plant of the same species. The process is rather different in angiosperms (flowering plants) from what it is in gymnosperms (other seed plants). In angiosperms, after the pollen grain has landed on the stigma, it creates a pollen tube which grows down the style until it reaches the ovary. Sperm cells from the pollen grain then move along the pollen tube, enter the egg cell through the micropyle and fertilise it, resulting in the production of a seed. A successful angiosperm pollen grain (gametophyte) containing the male gametes is transported to the stigma, where it germinates and its pollen tube grows down the style to the ovary. Its two gametes travel down the tube to where the gametophyte(s) containing the female gametes are held within the carpel. One nucleus fuses with the polar bodies to produce the endosperm tissues, and the other with the ovule to produce the embryo Hence the term: "double fertilization". In gymnosperms, the ovule is not contained in a carpel, but exposed on the surface of a dedicated support organ, such as the scale of a cone, so that the penetration of carpel tissue is unnecessary. Details of the process vary according to the division of gymnosperms in question. Two main modes of fertilization are found in gymnosperms. Cycads and Ginkgo have motile sperm that swim directly to the egg inside the ovule, whereas conifers and gnetophytes have sperm that are unable to swim but are conveyed to the egg along a pollen tube. The study of pollination brings together many disciplines, such as botany, horticulture, entomology, and ecology. The pollination process as an interaction between flower and pollen vector was first addressed in the 18th century by Christian Konrad Sprengel. It is important in horticulture and agriculture, because fruiting is dependent on fertilization: the result of pollination. The study of pollination by insects is known as anthecology. Pollen germination has three stages; hydration, activation and pollen tube emergence. The pollen grain is severely dehydrated so that its mass is reduced enabling it to be more easily transported from flower to flower. Germination only takes place after rehydration, ensuring that premature germination does not take place in the anther. Hydration allows the plasma membrane of the pollen grain to reform into its normal bilayer organization providing an effective osmotic membrane. Activation involves the development of actin filaments throughout the cytoplasm of the cell, which eventually become concentrated at the point from which the pollen tube will emerge. Hydration and activation continue as the pollen tube begins to grow. In conifers, the reproductive structures are borne on cones. The cones are either pollen cones (male) or ovulate cones (female), but some species are monoecious and others dioecious. A pollen cone contains hundreds of microsporangia carried on (or borne on) reproductive structures called sporophylls. Spore mother cells in the microsporangia divide by meiosis to form haploid microspores that develop further by two mitotic divisions into immature male gametophytes (pollen grains). The four resulting cells consist of a large tube cell that forms the pollen tube, a generative cell that will produce two sperm by mitosis, and two prothallial cells that degenerate. These cells comprise a very reduced microgametophyte, that is contained within the resistant wall of the pollen grain. The pollen grains are dispersed by the wind to the female, ovulate cone that is made up of many overlapping scales (sporophylls, and thus megasporophylls), each protecting two ovules, each of which consists of a megasporangium (the nucellus) wrapped in two layers of tissue, the integument and the cupule, that were derived from highly modified branches of ancestral gymnosperms. When a pollen grain lands close enough to the tip of an ovule, it is drawn in through the micropyle ( a pore in the integuments covering the tip of the ovule) often by means of a drop of liquid known as a pollination drop. The pollen enters a pollen chamber close to the nucellus, and there it may wait for a year before it germinates and forms a pollen tube that grows through the wall of the megasporangium (=nucellus) where fertilisation takes place. During this time, the megaspore mother cell divides by meiosis to form four haploid cells, three of which degenerate. The surviving one develops as a megaspore and divides repeatedly to form an immature female gametophyte (egg sac). Two or three archegonia containing an egg then develop inside the gametophyte. Meanwhile, in the spring of the second year two sperm cells are produced by mitosis of the body cell of the male gametophyte. The pollen tube elongates and pierces and grows through the megasporangium wall and delivers the sperm cells to the female gametophyte inside. Fertilisation takes place when the nucleus of one of the sperm cells enters the egg cell in the megagametophyte’s archegonium. In flowering plants, the anthers of the flower produce microspores by meiosis. These undergo mitosis to form male gametophytes, each of which contains two haploid cells. Meanwhile, the ovules produce megaspores by meiosis, further division of these form the female gametophytes, which are very strongly reduced, each consisting only of a few cells, one of which is the egg. When a pollen grain adheres to the stigma of a carpel it germinates, developing a pollen tube that grows through the tissues of the style, entering the ovule through the micropyle. When the tube reaches the egg sac, two sperm cells pass through it into the female gametophyte and fertilisation takes place. Abiotic pollination refers to situations where pollination is mediated without the involvement of other organisms. The most common form of abiotic pollination, anemophily, is pollination by wind. Wind pollination is very imprecise, with a minute proportion of pollen grains landing by chance on a suitable receptive stigma, the rest being wasted in the environment. This form of pollination is used by grasses, most conifers, and many deciduous trees. Hydrophily is pollination by water, and occurs in aquatic plants which release their pollen directly into the surrounding water. About 80% of all plant pollination is biotic. In gymnosperms, biotic pollination is generally incidental when it occurs, though some gymnosperms and their pollinators are mutually adapted for pollination. The best-known examples probably are members of the order Cycadales and associated species of beetles. Of the abiotically pollinated species of plant, 98% are anemophilous and 2% hydrophilous, their pollen being transported by water. It is thought that among angiosperms, entomophily is the primitive state; this is indicated by the vestigial nectaries in the wind-pollinated Urtica and other plants, and the presence of fragrances in some of these plants. Of the angiosperms, grasses, sedges, rushes and catkin-bearing plants are in general wind pollinated. Other flowering plants are mostly biotic, the pollen being carried by animal vectors. However a number of plants in multiple families have secondarily adopted wind pollination in contrast to other members of their groups. Some plants are intermediate between the two pollination methods. common heather is regularly pollinated by insects, but produce clouds of pollen and some wind pollination is inevitable, and the hoary plantain is primarily wind pollinated, but is also visited by insects which pollinate it. More commonly, the process of pollination requires pollinators: organisms that carry or move the pollen grains from the anther of one flower to the receptive part of the carpel or pistil (stigma) of another. This is biotic pollination. The various flower traits (and combinations thereof) that differentially attract one type of pollinator or another are known as pollination syndromes. At least 100,000 species of animal, and possibly as many as 200,000, act as pollinators of the estimated 250,000 species of flowering plants in the world. The majority of these pollinators are insects, but about 1,500 species of birds and mammals have been reported to visit flowers and may transfer pollen between them. Besides birds and bats which are the most frequent visitors, these include monkeys, lemurs, squirrels, rodents and possums. Entomophily, pollination by insects, often occurs on plants that have developed colored petals and a strong scent to attract insects such as, bees, wasps and occasionally ants (Hymenoptera), beetles (Coleoptera), moths and butterflies (Lepidoptera), and flies (Diptera). The existence of insect pollination dates back to the dinosaur era. In zoophily, pollination is performed by vertebrates such as birds and bats, particularly, hummingbirds, sunbirds, spiderhunters, honeyeaters, and fruit bats. Plants adapted to using bats or moths as pollinators typically have white petals and a strong scent and flower at night, whereas plants that use birds as pollinators tend to produce copious nectar and have red petals. Insect pollinators such as honeybees (Apis mellifera), bumblebees (Bombus terrestris), and butterflies (Thymelicus flavus) have been observed to engage in flower constancy, which means they are more likely to transfer pollen to other conspecific plants. This can be beneficial for the pollinators, as flower constancy prevents the loss of pollen during interspecific flights and pollinators from clogging stigmas with pollen of other flower species. It also improves the probability that the pollinator will find productive flowers easily accessible and recognisable by familiar clues. A European honey bee collects nectar, while pollen collects on its body. Cross-pollination, also called allogamy, occurs when pollen is delivered from the stamen of one flower to the stigma of a flower on another plant of the same species. Plants adapted for cross-pollination have several mechanisms to prevent self-pollination; the reproductive organs may be arranged in such a way that self-fertilisation is unlikely, or the stamens and carpels may mature at different times. Self-pollination occurs when pollen from one flower pollinates the same flower or other flowers of the same individual. It is thought to have evolved under conditions when pollinators were not reliable vectors for pollen transport, and is most often seen in short-lived annual species and plants that colonize new locations. Self-pollination may include autogamy, where pollen is transferred to the female part of the same flower; or geitonogamy, when pollen is transferred to another flower on the same plant. Plants adapted to self-fertilize often have similar stamen and carpel lengths. Plants that can pollinate themselves and produce viable offspring are called self-fertile. Plants that cannot fertilize themselves are called self-sterile, a condition which mandates cross-pollination for the production of offspring. Cleistogamy: is self-pollination that occurs before the flower opens. The pollen is released from the anther within the flower or the pollen on the anther grows a tube down the style to the ovules. 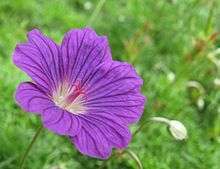 It is a type of sexual breeding, in contrast to asexual systems such as apomixis. Some cleistogamous flowers never open, in contrast to chasmogamous flowers that open and are then pollinated. Cleistogamous flowers are by necessity found on self-compatible or self-fertile plants. Although certain orchids and grasses are entirely cleistogamous, other plants resort to this strategy under adverse conditions. Often there may be a mixture of both cleistogamous and chasmogamous flowers, sometimes on different parts of the plant and sometimes in mixed inflorescences. The ground bean produces cleistogamous flowers below ground, and mixed cleistogamous and chasmogamous flowers above. 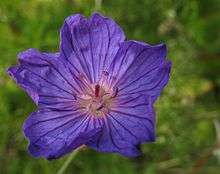 Geranium incanum, like most geraniums and pelargoniums, sheds its anthers, sometimes its stamens as well, as a barrier to self-pollination. This young flower is about to open its anthers, but has not yet fully developed its pistil. These Geranium incanum flowers have opened their anthers, but not yet their stigmas. Note the change of colour that signals to pollinators that it is ready for visits. An estimated 48.7% of plant species are either dioecious or self-incompatible obligate out-crossers. It is also estimated that about 42% of flowering plants exhibit a mixed mating system in nature. In the most common kind of mixed mating system, individual plants produce a single type of flower and fruits may contain self-pollinated, out-crossed or a mixture of progeny types. Pollination also requires consideration of pollenizers. The terms "pollinator" and "pollenizer" are often confused: a pollinator is the agent that moves the pollen, whether it be bees, flies, bats, moths, or birds; a pollenizer is the plant that serves as the pollen source for other plants. Some plants are self-compatible (self-fertile) and can pollinate and fertilize themselves. Other plants have chemical or physical barriers to self-pollination. In agriculture and horticulture pollination management, a good pollenizer is a plant that provides compatible, viable and plentiful pollen and blooms at the same time as the plant that is to be pollinated or has pollen that can be stored and used when needed to pollinate the desired flowers. Hybridization is effective pollination between flowers of different species, or between different breeding lines or populations. see also Heterosis. Peaches are considered self-fertile because a commercial crop can be produced without cross-pollination, though cross-pollination usually gives a better crop. Apples are considered self-incompatible, because a commercial crop must be cross-pollinated. Many commercial fruit tree varieties are grafted clones, genetically identical. An orchard block of apples of one variety is genetically a single plant. Many growers now consider this a mistake. One means of correcting this mistake is to graft a limb of an appropriate pollenizer (generally a variety of crabapple) every six trees or so. Biotic pollen vectors are animals, usually insects, but also reptiles, birds, mammals, and sundry others, that routinely transport pollen and play a role in pollination. This is usually as a result of their activities when visiting plants for feeding, breeding or shelter. The pollen adheres to the vector's body parts such as face, legs, mouthparts, hair, feathers, and moist spots; depending on the particular vector. Such transport is vital to the pollination of many plant species. Any kind of animal that often visits or encounters flowers is likely to be a pollen vector to some extent. For example, a crab spider that stops at one flower for a time and then moves on, might carry pollen incidentally, but most pollen vectors of significant interest are those that routinely visit the flowers for some functional activity. They might feed on pollen, or plant organs, or on plant secretions such as nectar, and carry out acts of pollination on the way. Many plants bear flowers that favour certain types of pollinator over all others. This need not always be an effective strategy, because some flowers that are of such a shape that they favor pollinators that pass by their anthers and stigmata on the way to the nectar, may get robbed by ants that are small enough to bypass the normal channels, or by short-tongued bees that bite through the bases of deep corolla tubes to extract nectar at the end opposite to the anthers and stigma. Some flowers have specialized mechanisms to trap pollinators to increase effectiveness. Other flowers will attract pollinators by odor. For example, bee species such as Euglossa cordata are attracted to orchids this way, and it has been suggested that the bees will become intoxicated during these visits to the orchid flowers, which last up to 90 minutes. However, in general, plants that rely on pollen vectors tend to be adapted to their particular type of vector, for example day-pollinated species tend to be brightly coloured, but if they are pollinated largely by birds or specialist mammals, they tend to be larger and have larger nectar rewards than species that are strictly insect-pollinated. They also tend to spread their rewards over longer periods, having long flowering seasons; their specialist pollinators would be likely to starve if the pollination season were too short. As for the types of pollinators, reptile pollinators are known, but they form a minority in most ecological situations. They are most frequent and most ecologically significant in island systems, where insect and sometimes also bird populations may be unstable and less species-rich. Adaptation to a lack of animal food and of predation pressure, might therefore favour reptiles becoming more herbivorous and more inclined to feed on pollen and nectar. Most species of lizards in the families that seem to be significant in pollination seem to carry pollen only incidentally, especially the larger species such as Varanidae and Iguanidae, but especially several species of the Gekkonidae are active pollinators, and so is at least one species of the Lacertidae, Podarcis lilfordi, which pollinates various species, but in particular is the major pollinator of Euphorbia dendroides on various Mediterranean islands. Mammals are not generally thought of as pollinators, but some rodents, bats and marsupials are significant pollinators and some even specialise in such activities. In South Africa certain species of Protea (in particular Protea humiflora, P. amplexicaulis, P. subulifolia, P. decurrens and P. cordata) are adapted to pollination by rodents (particularly Cape Spiny Mouse, Acomys subspinosus) and elephant shrews (Elephantulus species). 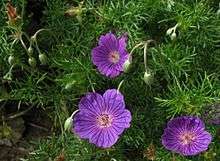 The flowers are borne near the ground, are yeasty smelling, not colourful, and sunbirds reject the nectar with its high xylose content. The mice apparently can digest the xylose and they eat large quantities of the pollen. In Australia pollination by flying, gliding and earthbound mammals has been demonstrated. Examples of pollen vectors include many species of wasps, that transport pollen of many plant species, being potential or even efficient pollinators. The first fossil record for abiotic pollination is from fern-like plants in the late Carboniferous period. Gymnosperms show evidence for biotic pollination as early as the Triassic period. Many fossilized pollen grains show characteristics similar to the biotically dispersed pollen today. Furthermore, the gut contents, wing structures, and mouthpart morphologies of fossilized beetles and flies suggest that they acted as early pollinators. The association between beetles and angiosperms during the early Cretaceous period led to parallel radiations of angiosperms and insects into the late Cretaceous. The evolution of nectaries in late Cretaceous flowers signals the beginning of the mutualism between hymenopterans and angiosperms. Bees provide a good example of the mutualism that exists between hymenopterans and angiosperms. Flowers provide bees with nectar (an energy source) and pollen (a source of protein). When bees go from flower to flower collecting pollen they are also depositing pollen grains onto the flowers, thus pollinating them. While pollen and nectar, in most cases, are the most notable reward attained from flowers, bees also visit flowers for other resources such as oil, fragrance, resin and even waxes. It has been estimated that bees originated with the origin or diversification of angiosperms. In addition, cases of coevolution between bee species and flowering plants have been illustrated by specialized adaptations. For example, long legs are selected for in Rediviva neliana, a bee that collects oil from Diascia capsularis, which have long spur lengths that are selected for in order to deposit pollen on the oil-collecting bee, which in turn selects for even longer legs in R. neliana and again longer spur length in D. capsularis is selected for, thus, continually driving each other's evolution. An Andrena bee collects pollen among the stamens of a rose. The female carpel structure appears rough and globular to the left. The bee's stash of pollen is on its hind leg. Blueberries being pollinated by bumblebees. Bumblebee hives need to be bought each year as the queens must hibernate (unlike honey bees). They are used nonetheless as they offer advantages with certain fruits as blueberries (such as the fact that they are active even at colder outdoor ambient temperature). Well-pollinated blackberry blossom begins to develop fruit. Each incipient drupelet has its own stigma and good pollination requires the delivery of many grains of pollen to the flower so that all drupelets develop. Pollination management is a branch of agriculture that seeks to protect and enhance present pollinators and often involves the culture and addition of pollinators in monoculture situations, such as commercial fruit orchards. The largest managed pollination event in the world is in Californian almond orchards, where nearly half (about one million hives) of the US honey bees are trucked to the almond orchards each spring. New York's apple crop requires about 30,000 hives; Maine's blueberry crop uses about 50,000 hives each year. 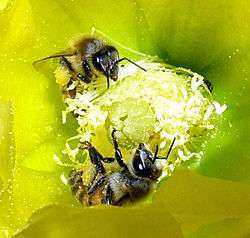 Bees are also brought to commercial plantings of cucumbers, squash, melons, strawberries, and many other crops. Honey bees are not the only managed pollinators: a few other species of bees are also raised as pollinators. The alfalfa leafcutter bee is an important pollinator for alfalfa seed in western United States and Canada. Bumblebees are increasingly raised and used extensively for greenhouse tomatoes and other crops. The ecological and financial importance of natural pollination by insects to agricultural crops, improving their quality and quantity, becomes more and more appreciated and has given rise to new financial opportunities. The vicinity of a forest or wild grasslands with native pollinators near agricultural crops, such as apples, almonds or coffee can improve their yield by about 20%. The benefits of native pollinators may result in forest owners demanding payment for their contribution in the improved crop results – a simple example of the economic value of ecological services. Farmers can also raise native crops in order to promote native bee pollinator species as shown with L. vierecki in Delaware and L. leucozonium in southwest Virginia. The American Institute of Biological Sciences reports that native insect pollination saves the United States agricultural economy nearly an estimated $3.1 billion annually through natural crop production; pollination produces some $40 billion worth of products annually in the United States alone. Pollination of food crops has become an environmental issue, due to two trends. The trend to monoculture means that greater concentrations of pollinators are needed at bloom time than ever before, yet the area is forage poor or even deadly to bees for the rest of the season. The other trend is the decline of pollinator populations, due to pesticide misuse and overuse, new diseases and parasites of bees, clearcut logging, decline of beekeeping, suburban development, removal of hedges and other habitat from farms, and public concern about bees. Widespread aerial spraying for mosquitoes due to West Nile fears is causing an acceleration of the loss of pollinators. The US solution to the pollinator shortage, so far, has been for commercial beekeepers to become pollination contractors and to migrate. Just as the combine harvesters follow the wheat harvest from Texas to Manitoba, beekeepers follow the bloom from south to north, to provide pollination for many different crops. In some situations, farmers or horticulturists may aim to restrict natural pollination to only permit breeding with the preferred individuals plants. This may be achieved through the use of pollination bags. In some instances growers’ demand for beehives far exceeds the available supply. The number of managed beehives in the US has steadily declined from close to 6 million after WWII, to less than 2.5 million today. In contrast, the area dedicated to growing bee-pollinated crops has grown over 300% in the same time period. Additionally, in the past five years there has been a decline in winter managed beehives, which has reached an unprecedented rate of colony losses at near 30%. At present, there is an enormous demand for beehive rentals that cannot always be met. There is a clear need across the agricultural industry for a management tool to draw pollinators into cultivations and encourage them to preferentially visit and pollinate the flowering crop. By attracting pollinators like honeybees and increasing their foraging behavior, particularly in the center of large plots, we can increase grower returns and optimize yield from their plantings. ISCA Technologies, from Riverside California, created a semiochemical formulation called SPLAT Bloom, that modifies the behavior of honeybees, inciting them to visit flowers in every portion of the field. 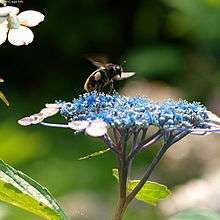 Loss of pollinators, also known as Pollinator decline (of which colony collapse disorder is perhaps the most well known) has been noticed in recent years. Observed losses would have significant economic impacts. Possible explanations for pollinator decline include habitat destruction, pesticide, parasitism/diseases, climate change and others, and many researchers believe it is the synergistic effects of these factors which are ultimately detrimental to pollinator populations. Wild pollinators often visit a large number of plant species and plants are visited by a large number of pollinator species. All these relations together form a network of interactions between plants and pollinators. Surprising similarities were found in the structure of networks consisting out of the interactions between plants and pollinators. This structure was found to be similar in very different ecosystems on different continents, consisting of entirely different species. The structure of plant-pollinator networks may have large consequences for the way in which pollinator communities respond to increasingly harsh conditions. Mathematical models, examining the consequences of this network structure for the stability of pollinator communities suggest that the specific way in which plant-pollinator networks are organized minimizes competition between pollinators and may even lead to strong indirect facilitation between pollinators when conditions are harsh. This means that pollinator species together can survive under harsh conditions. But it also means that pollinator species collapse simultaneously when conditions pass a critical point. This simultaneous collapse occurs, because pollinator species depend on each other when surviving under difficult conditions. Such a community-wide collapse, involving many pollinator species, can occur suddenly when increasingly harsh conditions pass a critical point and recovery from such a collapse might not be easy. The improvement in conditions needed for pollinators to recover, could be substantially larger than the improvement needed to return to conditions at which the pollinator community collapsed. ↑ Fritsch, Felix Eugene; Salisbury, Edward James (1920). "An introduction to the structure and reproduction of plants". G. Bell. ↑ Raghavan, Valayamghat (1997). Molecular Embryology of Flowering Plants. Cambridge University Press. pp. 210–216. ISBN 978-0-521-55246-2. 1 2 3 4 Campbell, Neil A.; Reece, Jane B. (2002). Biology (6th edition). Pearson Education. pp. 600–612. ISBN 978-0-201-75054-6. 1 2 Runions, C. John; Owens, John N. (1999). "Sexual reproduction of interior spruce (Pinaceae). I. Pollen germination to archegonial maturation". International Journal of Plant Sciences. 160 (4): 631–640. doi:10.1086/314170. 1 2 3 Abrol, Dharam P. (2012). "Non Bee Pollinators-Plant Interaction". Pollination Biology. Chapter 9: 265–310. doi:10.1007/978-94-007-1942-2_9. 1 2 Faegri, K.; Van Der Pijl, L. (2013). Principles of Pollination Ecology. Elsevier. pp. 34–40. ISBN 978-1-4832-9303-5. 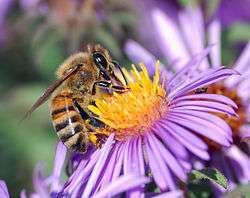 ↑ "Types of Pollination, Pollinators and Terminology". CropsReview.Com. Retrieved 2015-10-20. ↑ "Pollinator Syndromes". fs.fed.us. Retrieved 2015-10-20. ↑ "First ever record of insect pollination from 100 million years ago". ScienceDaily. Retrieved 2015-10-20. ↑ Rodríguez-Gironés, Miguel A.; Santamaría, Luis (2004). "Why are so many bird flowers red?". PLoS Biology. 2 (10): e306. doi:10.1371/journal.pbio.0020350. PMC 521733 . PMID 15486585. ↑ Hill, P.S.M. ; Wells, P.H. ; Wells, H. (1997). "Spontaneous flower constancy and learning in honey bees as a function of colour". Animal Behaviour. 54: 615–627. doi:10.1006/anbe.1996.0467. ↑ Stout, J.C.; Allen, J.A. ; Goulson, D. (1998). "The influence of relative plant density and floral morphological complexity on the behaviour of bumblebees". Oecologia. 117: 543–550. doi:10.1007/s004420050691. ↑ Chittka, L.; Gumbert, A.; Kunze, J. (1997). "Foraging dynamics of bumble bees: correlates of movement within and between plant species". Behavioral Ecology. 8 (3): 239–249. doi:10.1093/beheco/8.3.239. ↑ Goulson, D.; Ollerton, J.; Sluman, C. (1997). "Foraging strategies in the small skipper butterfly, Thymelicus flavus: when to switch?". Animal Behaviour. 53: 1009–1016. doi:10.1006/anbe.1996.0390. ↑ Harder, L. D., N.M. Williams, C.Y. Jordan, and W.A. Nelson. "The effects of Floral design and display on pollinator economics and pollen dispersal". 297-317. ↑ Editors, L. Chittka and J.D. Thomson. Cognitive Ecology of Pollination: Animal Behavior and Floral Evolution. 2001. Cambridge University Press. ↑ Chittka, L.; Thomson, J.D. ; Waser, N.M. (1999). "Flower constancy, insect psychology, and plant evolution". Naturwissenschaften. 86: 361–177. doi:10.1007/s001140050636. ↑ Cronk, J. K.; Fennessy, M. Siobhan (2001). Wetland plants: biology and ecology. Boca Raton, Fla.: Lewis Publishers. p. 166. ISBN 1-56670-372-7. ↑ Glover, Beverly J. (2007). Understanding flowers and flowering: an integrated approach. Oxford University Press. p. 127. ISBN 0-19-856596-8. 1 2 New Living Science: Biology for Class 9. Ratna Sagar. pp. 56–61. ISBN 978-81-8332-565-3. ↑ Culley, Theresa M.; Klooster, Matthew R. (2007). "The cleistogamous breeding system: a review of its frequency, evolution, and ecology in angiosperms". The Botanical Review. 73: 1–30. doi:10.1663/0006-8101(2007)73[1:TCBSAR]2.0.CO;2. ↑ Baskin, Carol C.; Baskin, Jerry M. (2001). Seeds: Ecology, Biogeography, and Evolution of Dormancy and Germination. Elsevier. p. 215. ISBN 978-0-12-080263-0. ↑ Igic B, Kohn JR (May 2006). "The distribution of plant mating systems: study bias against obligately outcrossing species". Evolution. 60 (5): 1098–103. doi:10.1554/05-383.1. PMID 16817548. ↑ Dressler, Robert L. (1968-03-01). "Pollination by Euglossine Bees". Evolution. 22 (1): 202–210. doi:10.2307/2406664. JSTOR 2406664. ↑ Sühs, R.B. ; Somavilla, A.; Putzke, J.; Köhle, A. (2009). 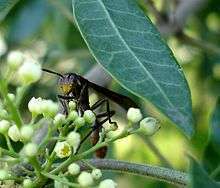 "Pollen vector wasps (Hymenoptera, Vespidae) of Schinus terebinthifolius Raddi (Anacardiaceae)". Brazilian Journal of Biosciences. Santa Cruz do Sul, RS, Brazil. pp. 138–143. ↑ W. Scott Armbruster (2012). "3". In Patiny, Sébastien. Evolution of Plant-Pollinator Relationships. Cambridge, UK: Cambridge University Press. pp. 45–67. ↑ Cardinal, Sophie; Danforth, Bryan N. (2013). "Bees diversified in the age of eudicots". Proceedings of the Royal Society. 280: 20122686. doi:10.1098/rspb.2012.2686. ↑ Steiner, Kim E.; Whitehead, V. B. (September 1990). "Pollinator adaptation to oil-secreting flowers--Rediviva and Diascia". Evolution. 44 (6): 1701–1707. doi:10.2307/2409348. ↑ Shao, Z.-Y. ; Mao, H.-X. ; Fu, W.-J. ; Ono, M.; Wang, D.-S.; Bonizzoni, M.; Zhang, Y.-P. (2004-01-01). "Genetic Structure of Asian Populations of Bombus ignitus (Hymenoptera: Apidae)". Journal of Heredity. 95 (1): 46–52. doi:10.1093/jhered/esh008. ISSN 0022-1503. PMID 14757729. ↑ Kuehn, F. Coordinator. (2015). 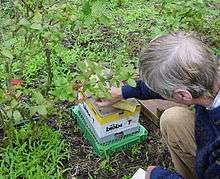 Farming for native bees. World Wide Web electronic publication. Retrieved from . (Accessed: September 22, 2015). ↑ Adamson, Nancy Lee. An Assessment of Non-Apis Bees as Fruit and Vegetable Crop Pollinators in Southwest Virginia. Diss. 2011. Web. 15 Oct. 2015. ↑ "US Forest Department: Pollinator Factsheet" (PDF). Retrieved 2014-04-18. ↑ Biesmeijer, JC; Roberts, SPM; Reemer, M; Ohlemuller, R; Edwards, M; Peeters, T; et al. (2006). ", Parallel declines in pollinators and insect-pollinated plants in Britain and the Netherlands". Science. 313: 351–354. doi:10.1126/science.1127863. ↑ Cox-Foster, DL; Conlan, S; Holmes, EC; Palacios, G; Evans, JD; Moran, NA; et al. (2007). ", A metagenomic survey of microbes in honey bee colony collapse disorder". Science. 318: 283–287. doi:10.1126/science.1146498. PMID 17823314. ↑ Woteki, Catherine (August 16, 2013). "The road to pollinator health". Science. 341 (6147): 695. doi:10.1126/science.1244271. ↑ "EFSA Press Release: EFSA identifies risks to bees from neonicotinoids". Efsa.europa.eu. Retrieved 2014-04-18. ↑ "ISCA Technologies: A Leader of Innovative Pest Management Tools and Solutions". Iscatech.com. Retrieved 2014-04-18. ↑ David Ward Roubik. Ups and Downs in Pollinator Populations: When is there a Decline? ↑ Bascompte, J.; Jordano, P.; Melián, C. J.; Olesen, J. M. (2003). "The nested assembly of plant–animal mutualistic networks". Proceedings of the National Academy of Sciences. 100 (16): 9383–9387. doi:10.1073/pnas.1633576100. ↑ Bastolla, U.; Fortuna, M. A.; Pascual-García, A.; Ferrera, A.; Luque, B.; Bascompte, J. (2009). "The architecture of mutualistic networks minimizes competition and increases biodiversity". Nature. 458 (7241): 1018–1020. doi:10.1038/nature07950. 1 2 3 Lever, J. J.; Nes, E. H.; Scheffer, M.; Bascompte, J. (2014). "The sudden collapse of pollinator communities". Ecology Letters. 17 (3): 350–359. doi:10.1111/ele.12236. Crepet WL, Friis EM, Nixon KC. 1991. Fossil evidence for the evolution of biotic pollination [and discussion]. Philosophical Transactions: Biological Sciences 333(1267) 187-195. Dafni, Amots; Kevan, Peter G.; and Husband, Brian C. (2005). Practical Pollination Biology. Enviroquest, Ltd. ISBN 978-0-9680123-0-7. Labandeira CC, Kvacek J, & Mostovski MB. 2007. Pollination drops, pollen and insect pollination of Mesozoic gymnosperms. Taxon 56(3) 663-695. Sihag, R.C. 1997.Pollination Biology: Basic and Applied Principles. Rajendra Scientific Publishers,Hisar, 210p. Look up pollination in Wiktionary, the free dictionary. Wikimedia Commons has media related to Pollination.